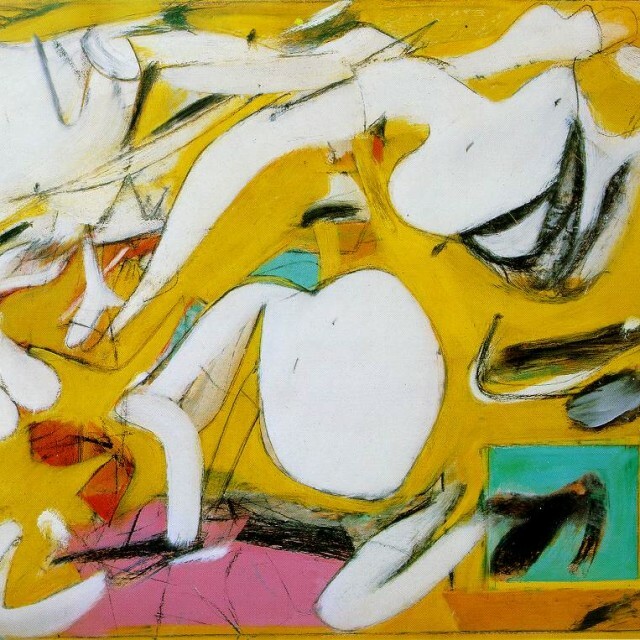 Willem de Kooning (1904-1997) is widely considered to be one of the greatest Abstract Expressionist painters of the post-World War II period, his dominance rivaled perhaps only by Jackson Pollock. Remembered for his large canvases as well as the controversial melding of both abstract and figurative imagery, de Kooning lived much longer than his contemporaries, many of whom had untimely deaths. The group of painters that would be identified as the New York School was made up of de Kooning and contemporaries such as Arshile Gorky and Edgar Denby, and they helped to establish New York City’s reputation as a center for artistic activity. Willem de Kooning was born on April 24, 1904, in Rotterdam, Holland. Both of his parents were involved in the sale of alcohol, his father as a distributor, and his mother as the proprietor of a bar. De Kooning’s parents separated when he was five, and after a brief period in which he lived with his father (with whom he was very close), his mother demanded that he live with her. The future painter’s artistic talents were evident even in childhood, and at the age of 12 he left school to apprentice with Jan and Jaap Giding, the proprietors of a large commercial art firm. When de Kooning had completed his training in traditional arts and crafts, the Gidings assisted him in enrolling in the Academie Voor Beeldende Kunsten en Technische Wetenschapen, where he attended evening classes for the next eight years (1916-1924). 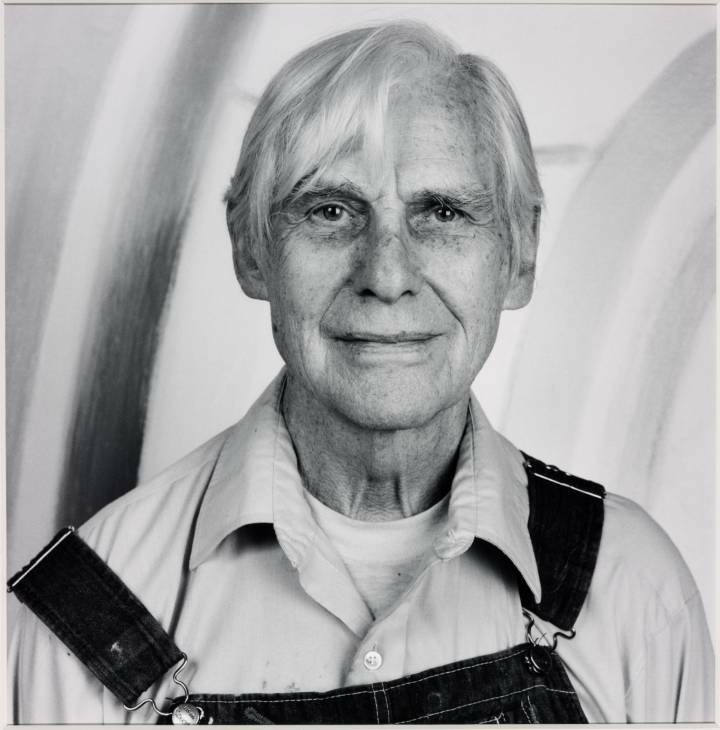 De Kooning graduated from the Academy in 1924, having received certification as both an artist and craftsperson. As a young man, de Kooning became familiar with the work of Walt Whitman, Frank Lloyd Wright, and Piet Mondrian. He also admired a group of Dutch abstract artists known as DeStijl, who counted Theo Van Doesburg and Mondrian among their ranks, and whose work he had first encountered while working for the art director of a Rotterdam department store from 1920-1923. De Kooning set sail in 1926 for the United States (he would not become a citizen of the U.S. until 1961), in the hope of becoming a commercial illustrator. 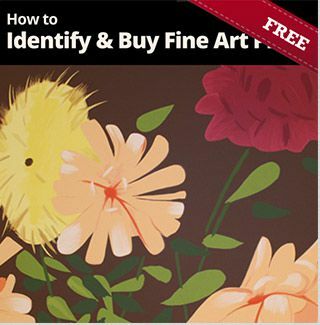 Despite his complete unfamiliarity with the English language, he was able to find work as a freelance commercial artist and housepainter. De Kooning settled in Hoboken, New Jersey, an area with a sizable Dutch population. The following year, he moved to New York City, where he developed friendships with artists including Edward Denby, Stuart Davis, and Arshile Gorky. He shared a studio with Gorky, who, along with Pablo Picasso, came to be a major influence on the painter’s early work. In 1935, de Kooning found full-time employment through the Works Progress Administration’s Federal Art Project, and in 1939 was commissioned by the New York World’s Fair to create a mural for the Hall of Pharmacy that he entitled Medicine. During this period, he also painted a series of portraits of men that included Self-Portrait with Imaginary Brother (1938), Two Men Standing (1938), and Glazier (1940). In 1942, de Kooning met the painter Jackson Pollock, with whom he formed the Club, an artists’ group that met primarily at 39 East 8th Street. Many of the Abstract Expressionists also gathered at the Cedar Bar, where they socialized with artists and intellectuals such as the poet and art critic Frank O’Hara and painters Joan Mitchell and Hans Hofmann. De Kooning married fellow painter Elaine Marie Fried in December of 1942. Over the years, he and his wife often lived in separate homes for extended periods of time, but as he grew older, Elaine spent more time at his house in East Hampton, Long Island. Elaine de Kooning was a respected Abstract Expressionist artist and critic in her own right; she painted President John F. Kennedy’s portrait for the Truman Library in Independence, Missouri, and taught at universities such as Yale and Carnegie Mellon. Work on abstract black and white oil paintings, considered by some to be de Kooning’s finest work, began in 1946; most of these works employed less expensive commercial paints made from enamel. These works included Attic (1949) and Excavation (1950). 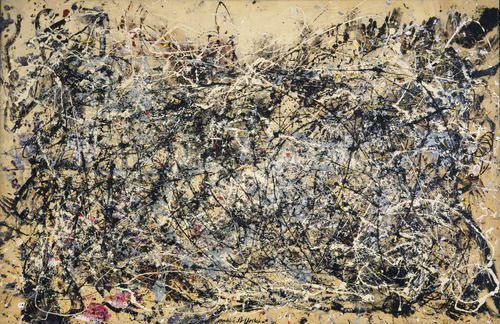 Excavation was one of the first large-scale paintings of the period, and was credited with cementing Abstract Expressionism’s role as the most important form of its time. The 1940s were years of great success for de Kooning. His first one-man show took place in 1948 at New York’s Charles Egan Gallery and was a critical success. It featured 10 abstract paintings, the majority of which had been rendered in black and white. Around this time, influential art critic Clement Greenberg named de Kooning one of the most important painters of the 20th century. 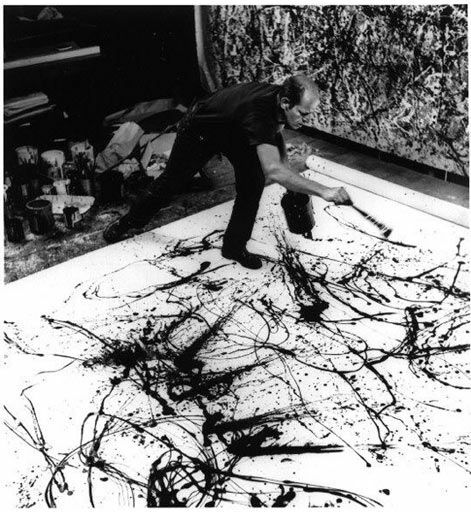 In June 1950, he was among six American artists (and, along with Jackson Pollock and Arshile Gorky, one of three Abstract Expressionist painters) chosen by the Museum of Modern Art’s Alfred H. Barr for exhibition in the 25th Venice Biennale in Italy. The following April marked his second one-man show; that year he also received, for Excavation, the $2,000 Logan Medal and Purchase Prize from The Art Institute of Chicago’s 60th Annual Survey of American Painting. 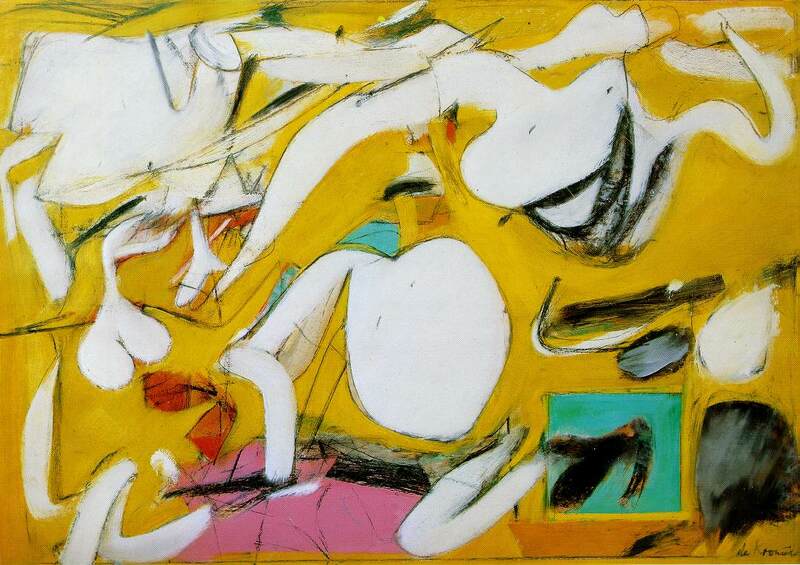 De Kooning was also among the artists chosen by the Museum of Modern Art to represent the United States at the 27th Biennale International in Venice, Italy. 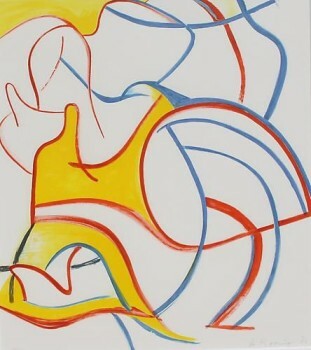 In March 1953, the Sidney Janis Gallery presented an exhibit of de Kooning’s work that featured six large oil paintings and several pastel sketches of a seated woman. The Woman series marked a move toward figurative representation, an approach that had been rejected by most other artists and thinkers associated with the Abstract Expressionist movement. The Museum of Modern Art bought the American works from the Venice exhibition for display in the New York museum’s 27th Biennale in 1954. The show focused on the work of Ben Shahn and de Kooning, and 27 of de Kooning’s paintings and drawings were available for view at the exhibit. In the late 1950s, de Kooning painted a number of large landscapes depicting quick impressions of urban scenes and highways, including Gotham News (1955-56), Backyard on 10th Street (1956), and Montauk Highway (1958). The painter moved in 1961 to East Hampton, Long Island, which was a favored locale among painters of the period. There, he began work on a glass-walled studio that was not fully completed until 1969. 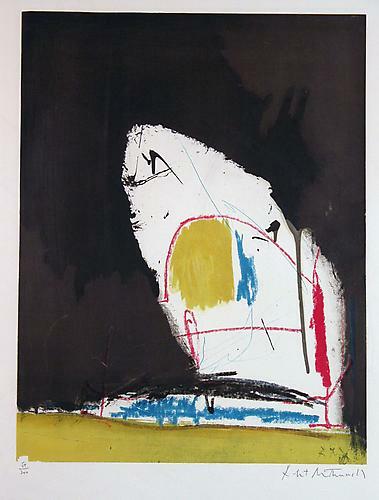 In the mid-1960s, with works such as Clam Diggers (1964) and Singing Woman (1965), he returned to the subject of women, this time placing the female figure in abstract landscapes. De Kooning would revisit this subject matter throughout his career. De Kooning’s later work focused on an extended examination of color and light, and he produced many untitled works that featured women and marine creatures, often employing unmixed colors. 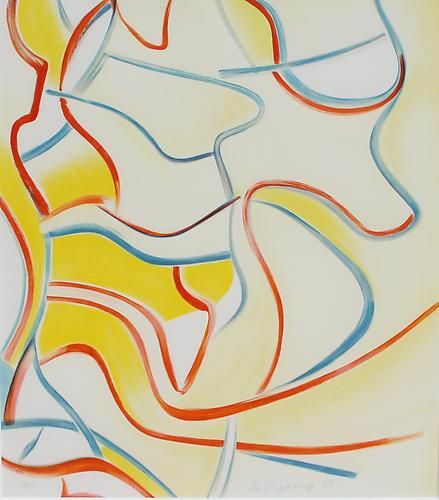 By the 1980s, a decade in which he completed over 300 pieces, his work took on a simpler form, emphasizing abstract orange, blue, and red lines that leapt from a canvas painted white. In this later work, de Kooning turned away from the influence of Picasso and began to look more toward the colorful silhouettes of late Matisse. Although he had been a hard drinker for much of his life, de Kooning abstained from alcohol in his later years. As he aged, the artist also suffered from the short-term memory loss associated with Alzheimer’s disease; fortunately, the disease did not affect his technical ability. Of de Kooning’s generation of painters, he was one of the few to survive to old age: Arshile Gorky and Mark Rothko committed suicide in 1948 and 1970, respectively, Jackson Pollock died in a car crash in 1956, and Franz Kline succumbed to a heart attack in 1962. De Kooning would not pass away until 1997, after a long battle with Alzheimer’s. The painter has been the subject of several retrospectives, including a 1953 show at the Boston Museum of Fine Arts that was later shown at the Workshop Art Center in Washington D.C. 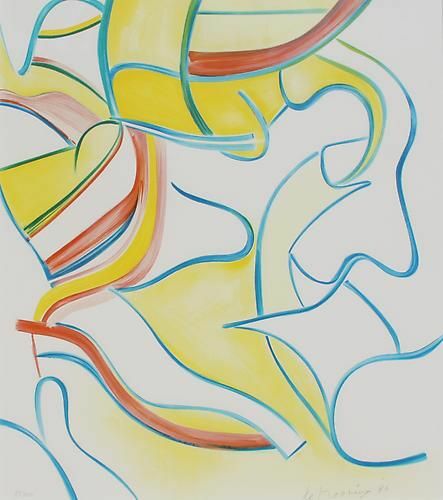 In 1978, the Guggenheim Museum presented “Willem de Kooning in East Hampton,” and in 1983 he was the subject of a retrospective at the Whitney Museum of American Art. He has served as a faculty member at North Carolina’s Black Mountain College (1948) and the Yale School of Fine Arts (1950-1951). President Lyndon B. Johnson presented him with the Presidential Medal of Freedom in 1964. Willem de Kooning’s work, vibrant and sometimes aggressive, continues to inspire generations of painters. Through their choice of residence and lifestyle, he and the other members of the New York School of painting helped to establish New York City as a center for artistic activity. De Kooning’s particular use of gestural painting ensured that he will be remembered as one of the most original and startling artists of the 20th century.